2011 Aspes Sibilla. Picture credits - Aspes. Submit more pictures. 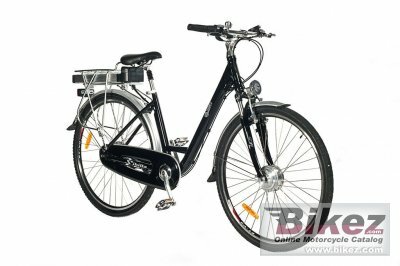 Provided with an electric motor without brush and with a LiFeP04 battery the power assisted bicycle Sibilla of Aspes allows long-distances to zero-impact and in total safety, the level of technology is at the top of the range, design and finishes are of excellence. Price as new (MSRP): Euro 1850. Prices depend on country, taxes, accessories, etc. Engine details: 250 W electric engine at front hub, brushless. Light: White leds, internal batteries. Red leds, internal batteries. Comments: Battery: Rear 36 V - 10 Ah (LiFePO4 Lithium phosphate) Reach 40 km. Recharging 4-6 hours. Battery is rechargeable without removal with supplied plug. Ask questions Join the 11 Aspes Sibilla discussion group or the general Aspes discussion group. Get a list of related motorbikes before you buy this Aspes. Inspect technical data. Look at photos. Read the riders' comments at the bike's discussion group. And check out the moped's reliability, repair costs, etc. Show any 2011 Aspes Sibilla for sale on our Bikez.biz Motorcycle Classifieds. You can also sign up for e-mail notification when such mopeds are advertised in the future. And advertise your old MC for sale. Our efficient ads are free. You are also welcome to read and submit motorcycle reviews.